Greystones' Paul Dunne crowned a magnificent 2017 when he received the “Professional of the Year” award from the Irish Golf Writers’ Association at the Allianz sponsored annual awards at Portmarnock Hotel and Golf Links last night. The former Walker Cup star (25) enjoyed a breakthrough year in just his second full season on tour, memorably chipping in at the 72nd hole for a closing 61 to win the British Masters by three shots on 20-under-par from a charging Rory McIlroy at Close House in Newcastle in October. In a season where he jumped from 275th to 76th in the world rankings, Dunne – who was also runner-up to Edoardo Molinari after a playoff for the Trophee Hassan II in Morocco in April — finished 16th in the final Race to Dubai standings with prize money of €1.7 million. 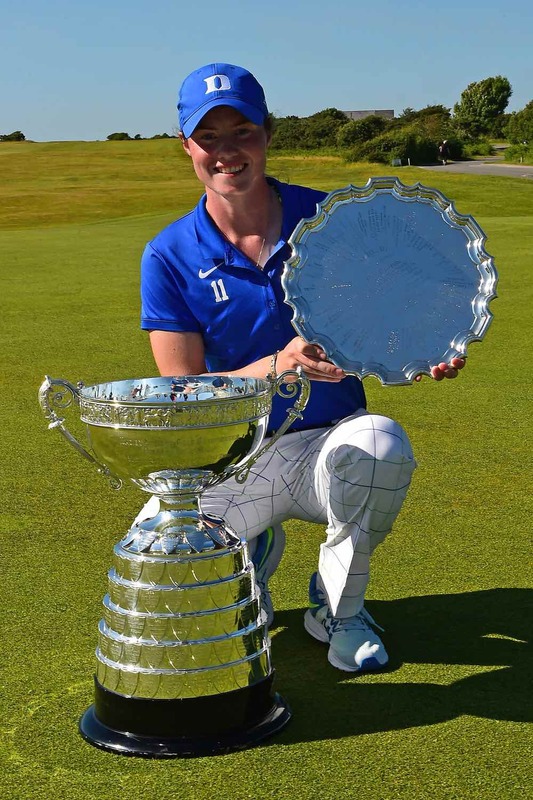 Slieve Russell’s Leona Maguire (23), the world number one ranked amateur player, earned the “Women’s Amateur of the Year” award while The Island’s Paul McBride (22) was voted “Men’s Amateur of the Year." It was another standout season for Maguire, who won the British Ladies Amateur Championship at Pyle & Kenfig in Wales, beating Spain’s Ainhoa Olarra 3 and 2 in the final. A final year student at Duke University in the United States, she was also the dominant player on the US collegiate circuit with five victories in the calendar year – the Northrop Grumman Regional Challenge, the LSU Tiger Classic, the ACC Championship, the Jim West Challenge and the Ruth’s Chris Tar Heel Invite – where she was named WGCA Player of the Year. A final year student at Wake Forest University in North Carolina, McBride was the sole Irish representative on the Great Britain and Ireland Walker team which was defeated by the United States at Los Angeles Country Club in September. He reached the quarter-final of the British Amateur Championship at Royal St George’s and made the cut in the Porsche European Open on the PGA European Tour on his debut in a professional event. The top-ranked Irish men’s player in the World Amateur Golf Ranking – currently ranked 41st – he also played a critical role in Ireland winning the Home Internationals for the fourth year running when he remained unbeaten, winning four and a half points from five matches at Moortown Golf Club in Leeds. Gavin Caldwell, the former captain of the R&A, and Michael Moss, the retired general manager of Portstewart Golf Club which played host to the Dubai Duty Free Irish Open, received “Distinguished Services to Golf” awards. Shane Lowry’s breakout season, which was highlighted by a stunning victory in the WGC-Bridgestone Invitational, has earned the 28-year-old Offalyman the accolade of “Professional of the Year” in the 2015 Irish Golf Writers’ Awards, sponsored by Carr Golf.